I've been in again tonight and didn't see those things! Craft bits are currently in the sale trollies, starting from 10p up to 1.99 for the scraper foil packs. I've just returned from the Stourbridge store and got lots of kitchen items reduced very heavily. 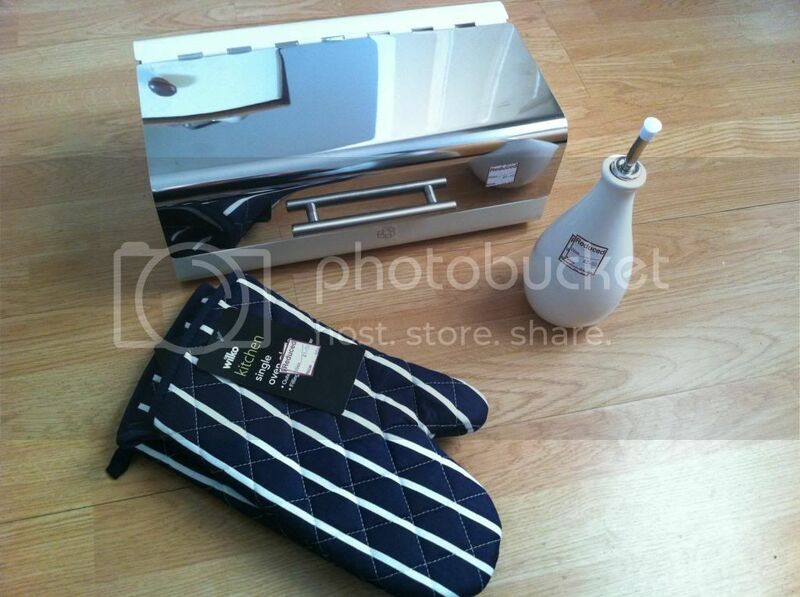 They had lots of the utensil sets, oven gloves (single and double), frying pans and tea towels left. Also lots of large reductions on red coloured bedding. Saw a red polka dot kingsize bed set for £7.50, but it wouldnt go with my bedroom colours sadly. Not sure if these reductions are in all stores, but will check out Kidderminster tomorrow. Seems as though the sale stock is different from store to store. Lots of bowls and square / round pasta dishes in the sale for £1.00 and 50p. Also black and silver sugar, tea, coffee canisters reduced to 50p each. These were in my local store too but no tea towels or frying pans. I wonder if they are reducing them in different stores at different times. Yeah the garlic press was a white plastic one think it was around £2 beforehand. I was looking online last night and noticed the cream / blue polka dot canisters, biscuit jar, bowls, plates, mugs etc have all been reduced. Not sure if instore but free click and collect to store. Bowls, plates and mugs NOW £1.00 each. Found some amazing reductions on the Clearance shelves (over towards the side wall through the paint shelves). Tiny Idols 2gig USB Flash Drive - 40pence. Set of 6 permanent double-ended coloured pens - 10pence. Small water colour paint sets in metal box - 10pence. Various craft bits and pieces - all 10pence e.g. vellum paper, pinking shears, envelopes for hand-made cards. They also had some lovely 10pence fancy paint tubes for craft work but a woman beat me to the lot! There were also a few normal paint tester pots for 10pence - limited amount and colour range. Looks like they were just clearing out old stock, so probably only available at this store. Just been to local. Stock will obviously vary. Single duvet sets for £2. Doublet duvet sets for £5. I see others having basket full of table covers/plate rests/posh table stuff and they clear the shelve already so none left. Double duvet 10.5tog for £1 was the main bargain for me. But I don't anticipate every store having this. Last edited by Fila; 26-02-2013 at 8:44 AM.